In these chapters I will explain to you what Cumulative Frequency. I will also provide you with Cumulative Frequency Graphs which we will use to find the median, quartiles and inter-quartile range with. Cumulative frequency is an important topic on your maths exam so study the following maths videos well during your revision. Have fun! Learn what cumulative frequency is and understand how to interpret the graph. 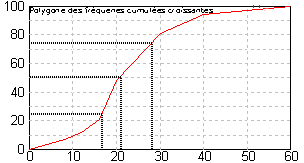 Here I will explain how to find the median and quartiles by looking at a cumulative frequency graph.